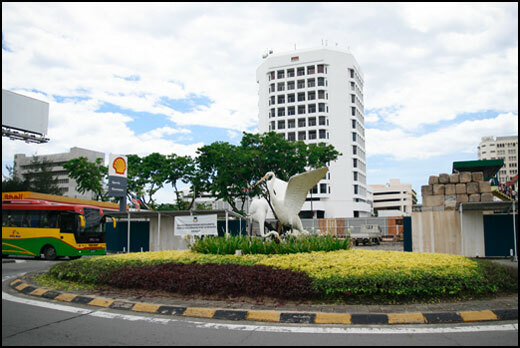 If you didn’t know, I went on a 3 days 2 nights trip to Kota Kinabalu the last weekend courtesy of MAS. My companions were none other than SL and the lovely couple of Kampungboycitygal. 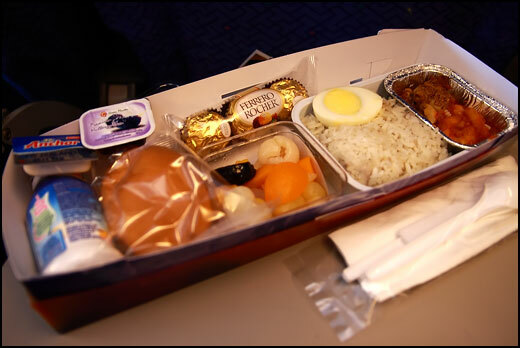 The total price (round trip) including tax is only RM444 for Economy class, very affordable. 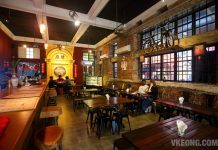 If you feel like visiting Kota Kinabalu after reading my experience, be quick and book a flight now while the seats and fares are still available! Better still, head on to MAS Facebook page, become a fan and enter the ongoing contests to win cool prizes like flight tickets. Our flight was at 9am, and check in was fast and easy using the kiosk check in at the airport. 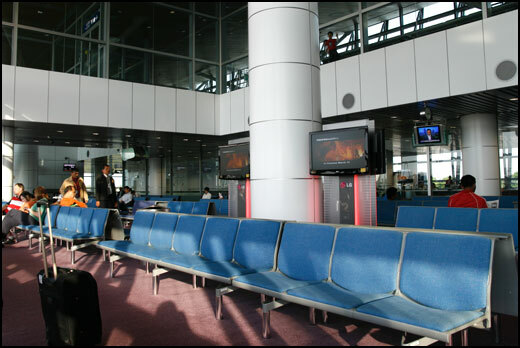 If you have any doubts while using the kiosk, feel free to ask the MAS staff around. I am sure they would be glad to assist you just like how they helped me. 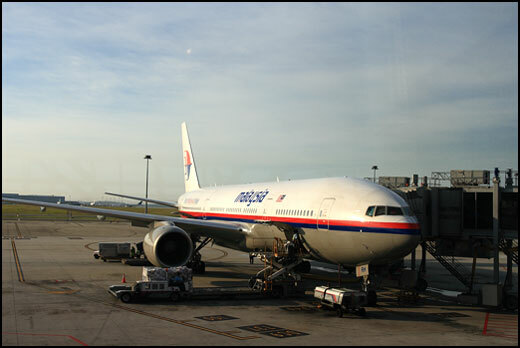 Oh, this was the plane we boarded – flight number MH80. Knowing that I will be going for white water rafting and island hopping, I brought extra clothing. It’s a good thing we are allowed up to 20 kg baggage allowance, more than enough for me to store my clothes, tripod and battery chargers for phone and camera. Yeah I know I bring a lot of stuff when I go traveling, even if it’s a short trip lol. 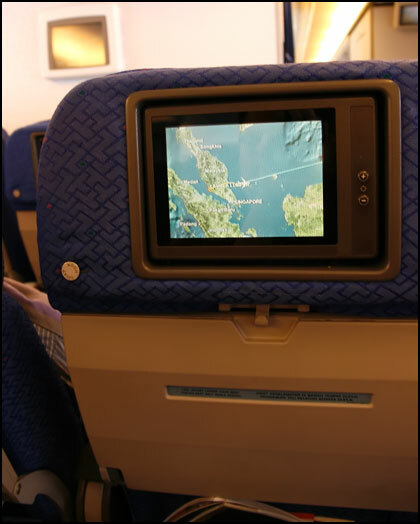 LCD screens displaying the flight route can be used to watch movies too. Our seats were comfortable with good leg space and MAS was courteous enough to provide each passenger a blanket and neck pillow. Although the journey took more than two hours, time flied when I chatted with Kampungboycitygal. 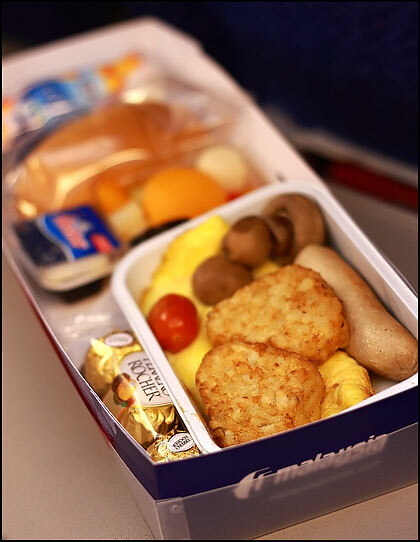 Shortly after take off, we were served breakfast with the options of nasi lemak or Western breakfast consisting of omelet, hash brown and sausage. I picked nasi lemak because I knew it’d be great based on my previous food tasting session. Glad to say it didn’t disappoint. Citygal’s breakfast meal. It had bun, butter, fruits, yogurt drink and some Ferrero Rocher chocolates just like mine. Thanks for letting me snap a photo lol. After touching down we bought a taxi coupon to our budget hotel – Lavender Lodge. The coupon cost RM20 and it’s pretty expensive if you ask me. Moreover the journey took only ten minutes! But that’s their minimum charge for a trip and no bargaining is allowed. We actually surveyed for the available hotels online and made our choice based on the guests’ feedback. Besides having many great reviews, Lavender Lodge looked pretty neat in the website too. 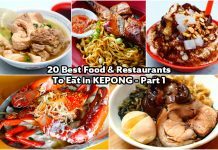 It is located in Kampung Ayer with a huge food court housing several seafood restaurants just across the road. What I liked about Lavender Lodge include the location, cleanliness, reasonable rates (RM65) and the friendly owner, who never got tired giving us tips on food and sightseeing. The only downside is when night comes, the street below Lavender Lodge would be invaded by transvestites – something we really didn’t expect. 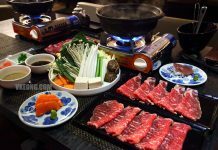 The first thing we did was none other than food hunting! 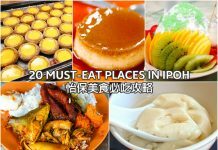 And we actually prepared a list of food we wanted to try by doing research on the internet, especially by reading other Sabahan’s food blog. Looking at our list, Wiya Chicken Rice was the nearest to us so that was our first stop. And do you know 50 cents is charged for the air conditioned seats upstairs? 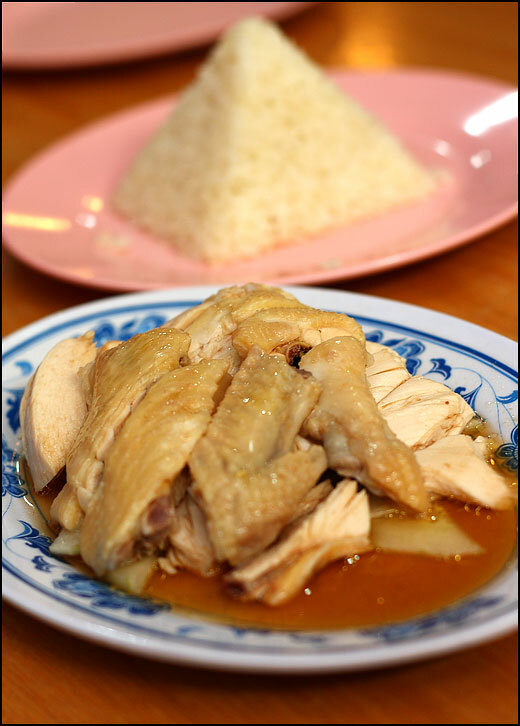 The special thing about Wiya’s Chicken Rice would be none other than the pyramid shaped rice. 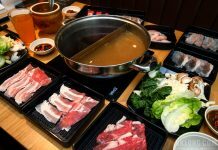 A lot of chicken stock must have been used to cook the rice, which gave it a flavorful taste and aromatic smell that was nothing short of appetizing. I guess I have seen all the possible shapes chicken rice can take lol. 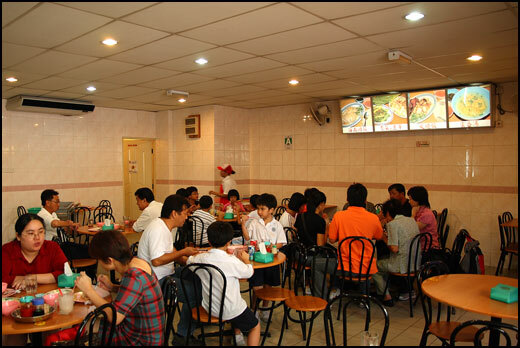 The next nearest destination was Yee Fung Coffee Shop at Gaya Street, famous for their Ngau Chap and Laksa. 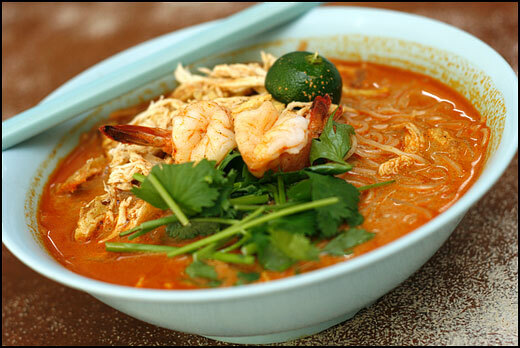 I didn’t like the Laksa because it had a weird bitter aftertaste. 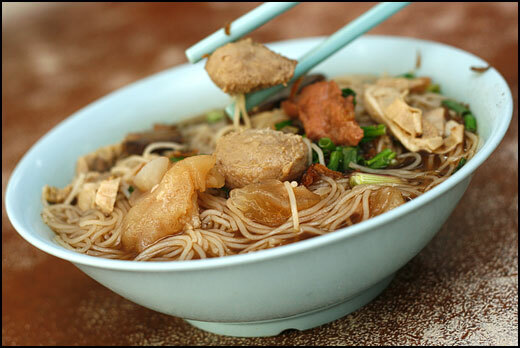 Luckily, the Ngau Chap (Noodle served with cow parts) was better. But I have to say the taste was very different compared to what I have had in the Peninsular. The next food on our list, Roti Kahwin was the hardest to find that day. 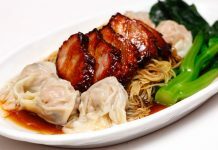 We actually saw it being sold in a few restaurants and cafe but we wanted to try the one touted to be the best in Fook Yuen. 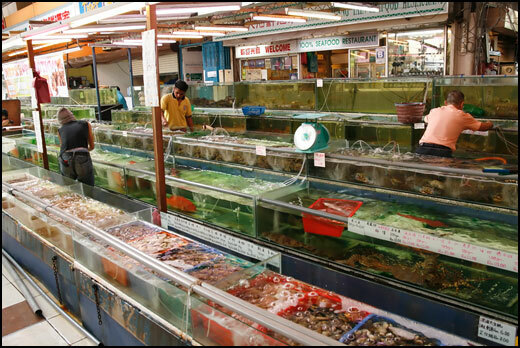 While looking for Fook Yuen we eventually ended up in the food court opposite our hotel and were amazed with what we saw, the number of seafood restaurants and the types of seafood available! 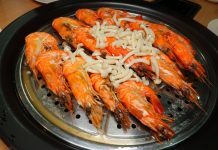 Red-orangish Tiger Prawns like these are a common sight in Kota Kinabalu’s seafood restaurants but they are definitely not cheap! 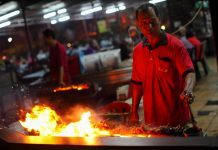 Each prawn costs RM20 to RM40 depending on the size. We saw a funny advertisement of Gardenia’s soft drinks at a sundry shop behind the food court, and I thought it was worth showing to you guys lol. 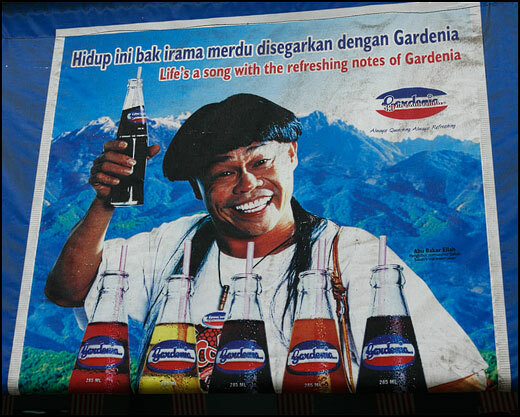 Seriously, I didn’t know Gardenia produced soft drinks because I thought Gardenia only baked bread and buns. 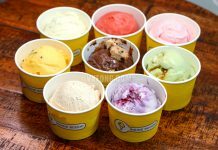 So, is this available only in East Malaysia? Anyway, we wanted to try a bottle but the shop wasn’t selling any. Hmm, bad luck? We were still unable to find Fook Yuen so we asked the owner of this camera shop for directions. 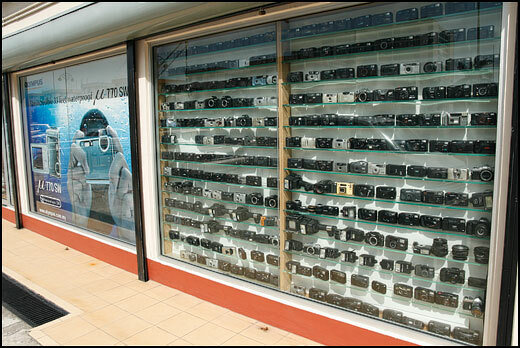 Look at the huge collection of cameras on display, it certainly caught my attention. 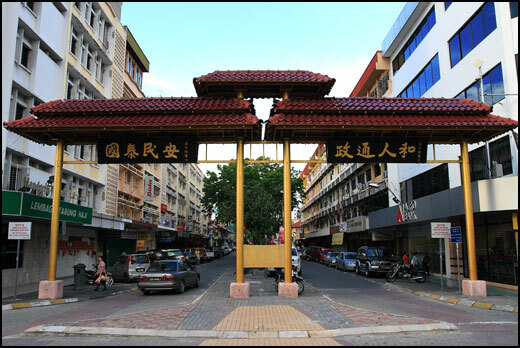 My first impression on Fook Yuen is that it’s the Kota Kinabalu’s version of Old Town Kopitiam. And Roti Kahwin (Married Bread) is basically just kaya and butter sandwiched between slices of think and fluffy white bread with an interesting name. Besides bread, the drinks get married too. 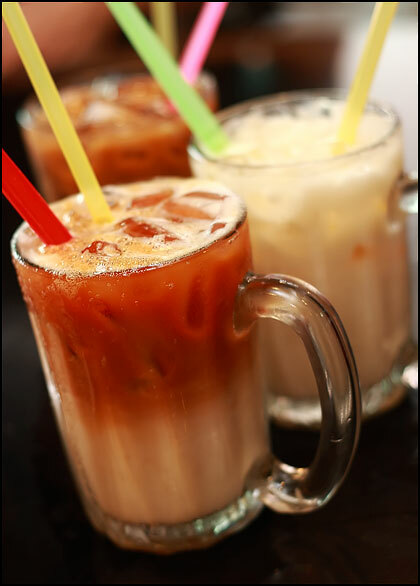 What we usually call as ‘cham’ – mixture of coffee and tea is called ‘kopi kahwin teh’ at Fook Yuen. I had Susu Kahwin simply because its name appealed to me the most to among all drinks. 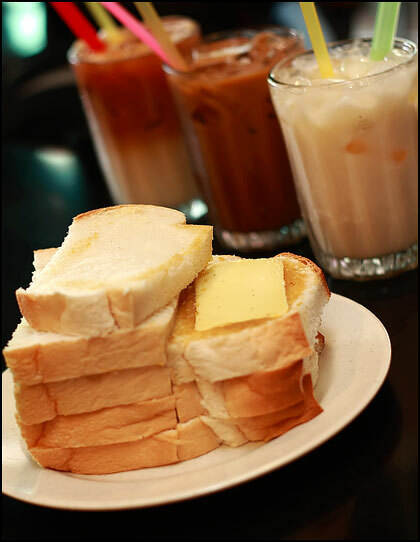 If you’re wondering, Susu Kahwin is prepared by mixing condensed milk with evaporated milk. And it tasted like, well, milk lol. After having three meals in a short period of time we decided it was time to stop eating before we stuff ourselves too full for dinner later. So, we visited the Filipino night market which was just about to start, where the stalls were still busy preparing to start business. 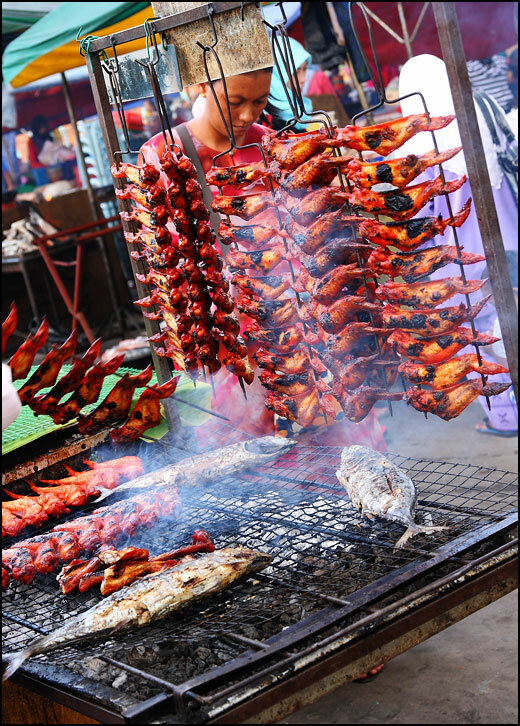 Barbecue was no doubt the most popular method for cooking chicken wings and seafood, almost every food stall is a BBQ stall like this! 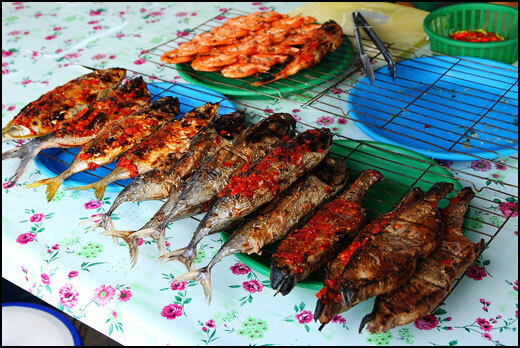 One of the many stalls selling barbecued fish and prawns fresh from the sea. They looked tempting alright but had a pungent sea-smell that drove us away. 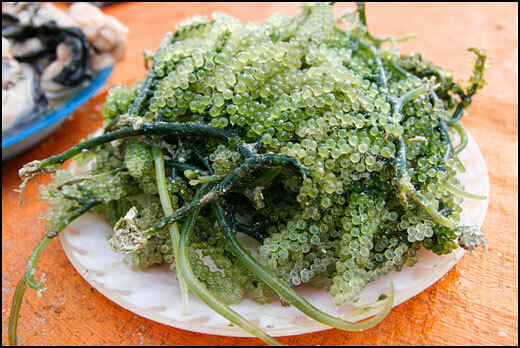 I remember seeing this plant somewhere and if I am not mistaken it’s a type of edible underwater algae. And I think this can only be found in Sabah, can anyone shed some light on this? 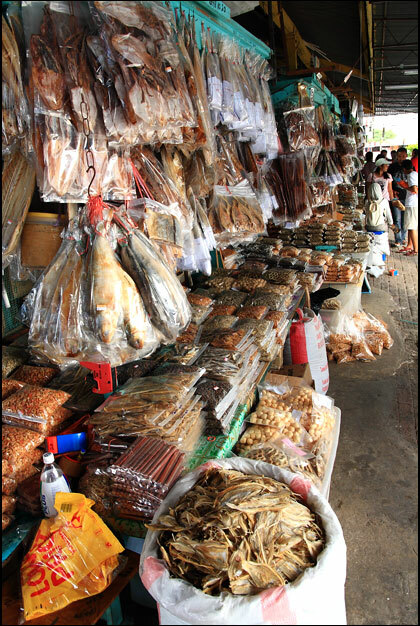 Salted fish and other types of dried seafood are sold in a dry market not too far from the Filipino night market. 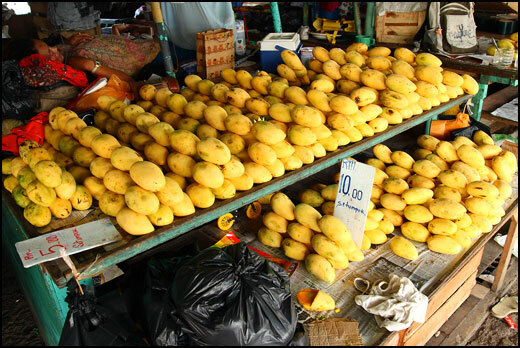 Looking for mangoes? There are aplenty here. 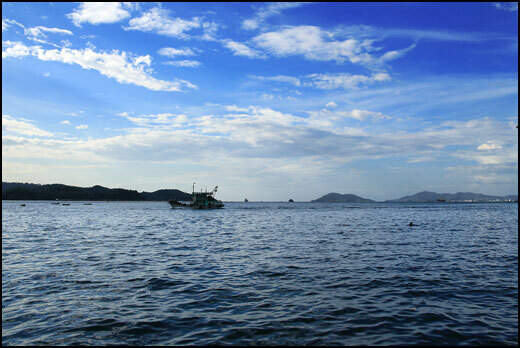 Next to the market is a stretch of seafood restaurants and pubs located along the seaside. With an unobstructed view of the sea, this area was especially popular with the foreign tourists having a beer or two. 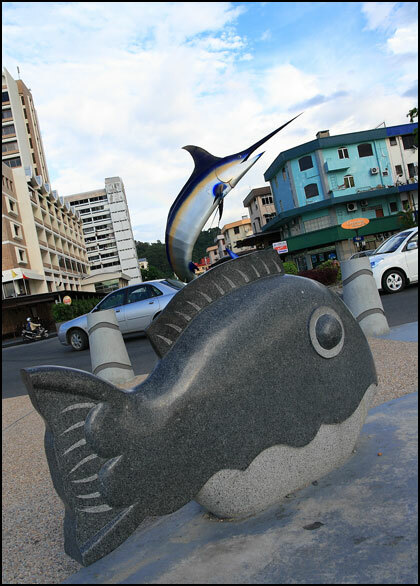 Being a popular landmark in Kota Kinabalu, the Segama Waterfront is perhaps one of the best spot for memorable photos. The park’s design is based on a concept of marine life and marine ornaments and observatory platform are some of the attractions here. 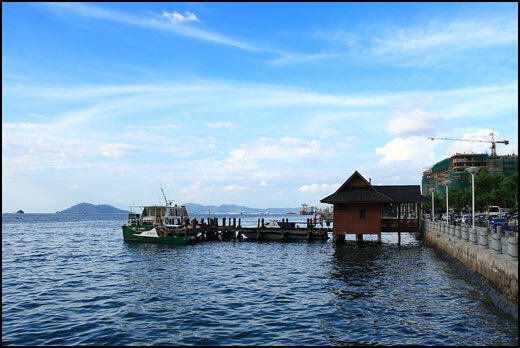 A private jetty owned by TAR Marine Park’s management. Initially, we thought we would be boarding the speed boats to island hopping here, until we asked the personnel there lol. The eight words written on the entrance to the business street carry a significant meaning: Stable politics and communal harmony are the essence to create a peaceful and prosperous country. 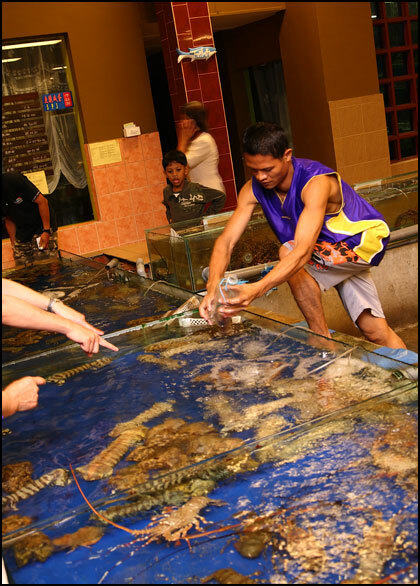 For dinner, the choice was easy since we’re in Kota Kinabalu – what else but seafood! 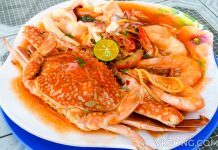 Based on the recommendations we got from friends staying in Kota Kinabalu, Ocean Seafood was the place to go considering we’re not taking a cab out of town. 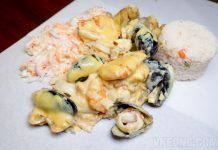 Apart from that, another reason we chose Ocean Seafood was because of the restaurant’s photos we saw in the other blogs. 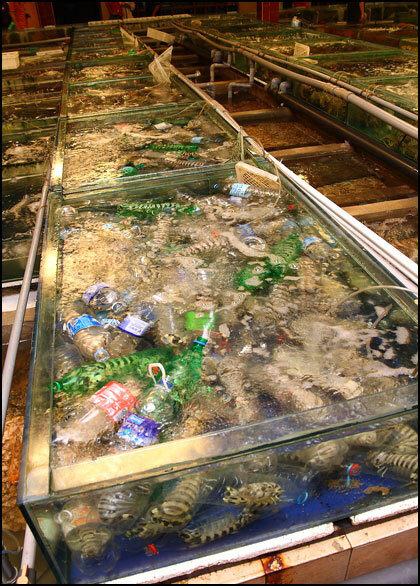 We simply had to see the area where tanks of live seafood are stored for ourselves, said to be larger than any seafood restaurant in the Peninsular has to offer. 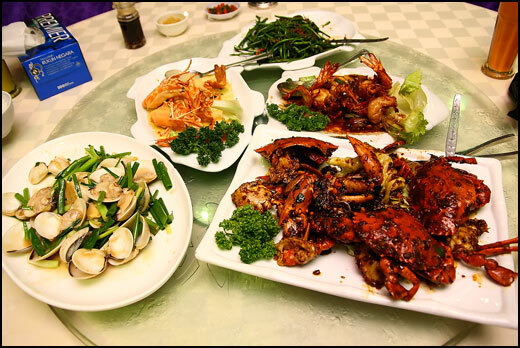 And of course, we are well aware that Ocean Seafood is a very expensive restaurant meant for tourists or the rich locals. 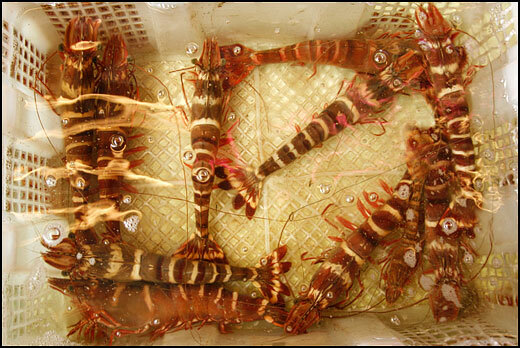 Mantis prawns are reared in plastic bottles to prevent them from fighting and killing each other. I didn’t know they could get so aggressive! Our seafood meal that cost us RM250 in total. 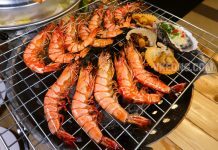 We had some really expensive tiger prawns (those I mentioned earlier, RM30 each), 1 kg of crab and clams and Sabah vegetable. 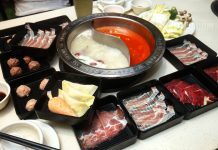 Among all the food, it was the coconut jelly that we truly enjoyed. 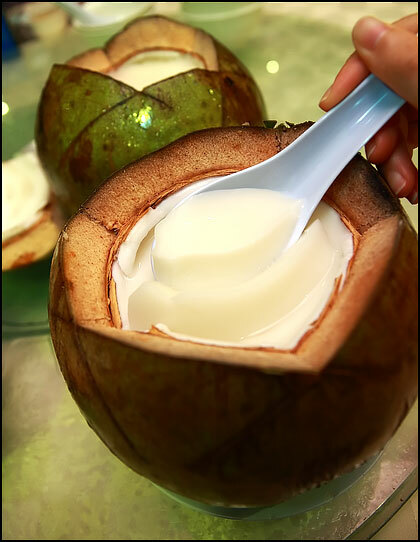 Each coconut was RM10 and had a soft and sweet coconut milk custard filling, which was simply yummy and will definitely make you want for more! And that ends the first day of our trip to Kota Kinabalu. We had to hit the sack early to gather enough rest for our activity the next day – White Water Rafting at Sungai Padas. Hopefully I will be able to share the experience next week!